Dual-cab utility buyers have had to cop second-rate interiors, handling dynamics and safety inclusions for years now – even in comparison to closely related 4WD wagons. Jump from a top-spec HiLux straight into a top-spec Prado, for example, to see what we mean. Despite this, dual-cabs sell in huge numbers and for families where one parent needs a utility vehicle for work during the week, many have also morphed into a default family vehicle for the weekends too. It’s fitting, then, that there’s never been a better time to buy a dual-cab utility in Australia. There’s a raft of new models either already released or due to be released this year. 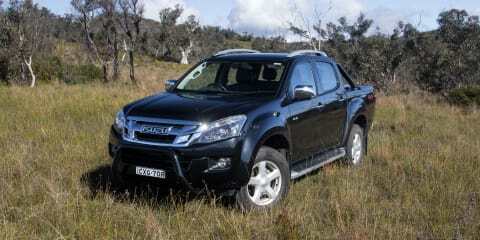 Two of the current crop, have been selected for comparison here, the Mitsubishi Triton and the Isuzu D-Max. The Triton has been heavily revised recently, while the D-Max has been around for a while but has punched well above its weight since release. Both are the range-toppers from their respective stables and both are better value than they’ve ever been thanks to improved refinement, more comfortable interiors and plenty of standard inclusions. Our test route will take in plenty of city commuting, freeway running, country back roads and some general dirt track off-roading. Both these vehicles are tough as nails in proper off-road situations and we’ve tested them before, but we’re focusing here more on the family, day-to-day use many examples will experience. Our dirt track testing ensures rural buyers haven’t been left out of the testing regimen. 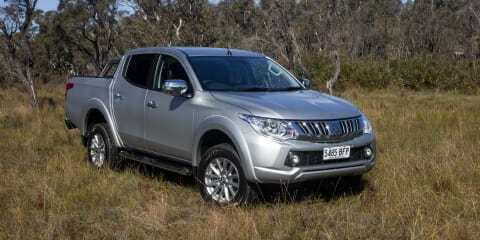 Read our Mitsubishi Triton pricing and specification breakdown here. Read our Isuzu D-Max pricing and specification breakdown here. This test takes place between the top specification grades from the respective manufacturers. That means we have a Mitsubishi Triton Exceed Double Cab and an Isuzu D-Max LS-Terrain 4×4 Crew Cab Ute going head to head. Our evaluation Triton is a lightly optioned Exceed model. Pricing starts at a quite frankly very reasonable $47,490 plus on-road costs for the top-spec Triton, plus on-road costs. Metallic paint adds $550, while the tow bar kit adds another $847. Totalled up, that’s $48,887 plus on-road costs. Triton weighs 1965kg in Exceed trim and has a braked towing capacity of 3100kg and a 935kg payload. Triton’s tray measures 1520mm long and 1470mm wide. The measurement between the wheel arches is 1085mm. The tray liner and soft cover as seen on our test model are both standard fitment for Exceed variants. Equipment highlights when you step up to the Exceed model include paddleshifters (that actually work), a rear diff lock, leather-look door inserts, smart key with push-button start, auto headlights and wipers, leather upholstery, power driver’s seat, Mitsubishi Multi Communication System, 7.0-inch touchscreen, 3D satellite navigation mapping and SD card input. Pricing for the D-Max in LS-Terrain grade kicks off from $53,000 plus on-road costs for the automatic. Our test vehicle has a number of options added to that base price including the tow bar kit which costs $639.10, the tub liner for $498.30, the three-piece hard tray lid $2479.40, the black sports bar for $719.40, the black nudge bar for $682.00 and the electric brake controller for $250.00. Those options add $5268.20 to the buy in price, meaning our test D-Max weighs in at $58,268.20 plus on-road costs. D-Max weighs 1935kg in LS-Terrain guise and has a braked towing capacity of 3500kg plus a 1015kg payload. D-Max’s tray measures 1552 long and 1530mm wide, while the width between the wheel arches is 1105mm. As Matt noted in his recent Triton review, even one specification grade down the ladder from this top-spec model, the Triton is the beneficiary of what we think is the best Mitsubishi interior on any current vehicle. The raft of extra sound deadening and extensive work that’s been put into refining the engine and transmission means it’s immediately quieter and more insulated than a Triton has ever been previously. Mitsubishi engineers have spent appreciable time redesigning the seats too, most notably the relationship of the front seat squabs to the floor. A recurring Triton/Challenger bugbear for CarAdvice was the distance between the squab and the floor, which made occupants feel like their legs were stretched out straight in front of them – not ideal for a 4WD truck. That’s been sorted now and the result is a much more comfortable driving position. Visibility remains impressive, but the Triton’s high rear tray section does encroach on that a little when you’re reversing into parking spots or executing a three-point turn. The standard reverse camera is definitely helpful in those instances though. The second row was – once upon a time – the Triton’s most significant advantage over all other dual-cab 4WDs. That stylised and heavily scalloped rear cab section was the reason there was so much room, as well as providing a seat back that wasn’t bordering on vertical in the second row. That advantage the Triton once had is not so clear-cut any more, with combatants such as Ranger and Amarok offering passenger car comfort in the second row. The Triton’s strong points, however, haven’t been diluted. The Triton is still comfortable in the second row, with plenty of knee room and shoulder room for two adults once the front seats have been adjusted to comfortably seat adults. There’s enough room to slip your feet under the seat in front, but it is a little tighter than we’d like, especially if you’ve got work boots on. Some buyers will lament the loss of the electric window in the rear screen that’s been deleted on the new model and it was definitely a Triton point of difference previously – now Navara will be the only dual-cab with that feature. Mitsubishi argues they tossed the electric rear window to liberate even more second-row cabin space. There’s plenty of useful storage throughout the Triton’s interior and the leather trim looks high quality enough to be hard wearing over the course of time. Most dual-cab 4WD owners spend plenty of time behind the wheel of their trucks and the good news for Mitsubishi fans is that the Triton is better and more comfortable behind the wheel than it’s ever been. Our top spec D-Max LS-Terrain felt reasonably premium in the cabin, although I’m not sure it felt premium to the tune of a 53 grand starting price. Comfort levels are high though and the seating position and visibility is excellent both on- and off-road. The leather trim and touch surfaces aren’t as well executed as the segment leaders, but they are beyond what the average truck previously offered. Like the Triton, the D-Max has a sensible array of controls and switchgear and won’t confuse buyers new to the brand or the segment. We spent long runs behind the wheel of each truck on test and never felt uncomfortable or fatigued. The D-Max has enough room in the second row for fully grown adults to be comfortable and the Triton’s edgier styling around the cab area doesn’t absolutely translate to a vastly more commodious cabin. The D-Max has plenty of room and comfort for passengers, including the crucial headroom test. You won’t be stopping to fit yourself in the second row of the D-Max. The Triton features ISOFIX restraints, where the D-Max doesn’t, a consideration that might be worth mulling over for some buyers. It’s fair to say that neither the Triton nor the D-Max are going to set the world on fire when it comes to infotainment and while the shortfalls of the previous Triton have been addressed, the new system is still not a world beater technologically. We preferred the user-friendliness of the D-Max’s system compared to the fiddly nature of the Triton’s. This, despite the fact that the system in the D-Max feels decidedly more aftermarket and less integrated than the Triton in terms of design and fitment. That said, the Triton’s system looks a lot smarter in the way it is integrated into the central dash layout than the D-Max’s arrangement. Both trucks provide a reliable Bluetooth connection for your smartphone and audio streaming also works as it should. Despite both these vehicles, especially the Triton, being a significant step forward from the models they replace, elements of the infotainment systems indicate that they are yet to be completely dragged kicking and screaming into 2015. The Triton’s 2.5-litre oiler is one of the smaller examples in the current field, so it’s fair to say that in the real world it punches above its weight. The four-cylinder turbo diesel generates 133kW at 3500rpm and 430Nm at 2500rpm. The ADR fuel claim is 7.6 litres per 100 kilometres with the automatic transmission. On test, we saw a fuel usage figure of 8.8L/100km, with an equal mix of city and country driving. The five-speed auto has fewer cogs than some, though it works exceptionally well with the engine. While it is small and in theory might have to work harder than some of the competition, there’s a feeling of effortlessness and ease to everything you ask the Triton to do. Around town at low speed, on the freeway at speed, or plugging around off-road accessing the torque, the Triton engine never feels like it’s reaching the outer edge of its performance reserves. It’s significant here to mention the vast improvement in refinement the Triton has delivered over the old engine. The insulation additions have quietened down everything from the initial rattle at start up to the engine noise under load. The Triton isn’t the quietest diesel in the world, but in this segment it’s now up with the leaders. In contrast, the D-Max’s larger, 3.0-litre turbo diesel retains its ‘agricultural’ charm. It’s also a case of less is more compared to the Triton with the D-Max achieving peak power of 130kW at 3600rpm and 380Nm between 1800 and 2800rpm. The slightly broader spread of peak torque undoubtedly helps the D-Max engine feel so comfortable at any speed. The ADR fuel claim for the D-Max is 8.1L/100km and we saw 9.2L/100km over the duration of our testing. Both vehicles achieved close to their theoretical numbers, although the new Triton is significantly more efficient in theory. Like the Triton, the D-Max’s five-speed automatic is also beautifully paired to the diesel engine, with a ratio spread that makes the most of the engine’s power and torque. The D-Max is discernibly louder than the Triton, and sounds like it’s working harder. It isn’t. The easy nature of the D-Max might provide some hint as to why Isuzu engines retain bulletproof reliability over so many kilometres. We like the new Triton’s ride on poor urban roads, even though it can jiggle around a little especially when it’s unladen. High-frequency bumps upset the balance a little too, but the Triton is significantly more composed than either the outgoing model, or trucks of old. There’s never any banging or crashing through the chassis into the cabin either, with the combination of added insulation and comfortable ride working admirably together. The Triton’s steering is likewise a definite step forward from the old model, and while not being quite as sharp lock-to-lock as we’d ultimately like, it’s significantly tighter than the D-Max. The steering is direct enough to head where you want to without flailing away at the wheel, and the wheel is never ripped out of your hands over nasty bumps. Shifting from sealed roads to the dirt, the Triton remains impressive. I appreciated its ability in heavy sand as well at launch on Fraser Island. There’s a more noticeable transition between surfaces though than in the D-Max, which manages to soak up nastier rutted dirt with a little more compliance. The payoff here, though, is a slight win to the Triton on road. It’s very close on road really, but the Triton is ever so slightly ahead. The D-Max is impressively well-mannered on road too, and as mentioned transitions onto the dirt more smoothly with less of a giveaway to passengers that the surface beneath the tyres has changed. D-Max just seems to iron out more of the rutted dirt surfaces we experienced during our off-road testing. Around town, the D-Max is let down by it’s wallowy, slow steering that feels a bit heavy and slow to react to inputs. Low-speed maneuvers and three-point turns can be a little annoying, not to mention tight parking spaces. Steering is an area where dual-cab utes really need to make a giant leap forward. Load either truck up with 500kg and we’d expect the ride to settle down appreciably and become even more comfortable. While the new Nissan Navara has moved to a coil spring rear end, these two trucks illustrate that there’s some life in the old leaf system yet, despite being nowhere near as advanced in geometry or capability. The Triton is covered by Mitsubishi’s five-year, 100,000km warranty with capped-price servicing up to 60,000km/48 months. The 12 months/15,000km service costs $350, the 24 months/30,000km costs $580, 36 months/45,000km costs $580 and the 48 months/60,000km service costs $580 as well. Over 60,000km, the Triton will cost buyers $2090. The D-Max is covered by Isuzu’s five-year, 130,000km warranty and also includes five years of roadside assistance. The D-Max is also covered by a capped-price servicing programme, which runs up to 60,000km/36 months. The first service at three months/3000km is free, six months/10,000km costs $260, 12 months/20,000km costs $360, 18 months/30,000km costs $260, 24 months/40,000km costs $760, 30 months/50,000km costs $155 and finally 36 months/60,000km costs $480. Over 60,000km, the D-Max will cost owners $2275. We expected this tussle to be tight from the outset, and after a solid two days behind the wheel, both around town and in the bush, that’s exactly how it panned out. Neither Matt nor I could separate the Triton or D-Max definitively. In mechanical terms and when you’re the driver, the D-Max and Triton are as close in the real world as they are on paper. The first issue is money – if you’re on a stringent budget, you’re going to opt for the Triton, given the fairly hefty disparity in the purchase price. Pure financial consideration ends that argument quick smart. For most buyers, though, there’s more to the story than just money especially when it comes to the dual-cab ute market. That’s why if it were my money, I’d buy the D-Max – but only just – and it would be the more affordable LS-U model I’d opt for as opposed to the LS-Terrain we’ve tested here. A decision made almost purely on styling isn’t necessarily the smartest option, but I just don’t love the new design of the Triton enough to drive one every day. The new model is certainly more attractive than the old model though. That said, both these vehicles performed well on and off road, both have long histories of bulletproof reliability and neither will let buyers down over the long haul. The dual-cab ute market is more popular than ever and buyers have more choice than ever before too. Click the Photos tab above to see more pictures by Christian Barbeitos.